Grunt Machine was a series of playfully irreverent and often surprising works of art on video, in which selected New Zealand artists respond to the question ‘How might rock music videos have affected video art?’ The results are rough and ready, spanning a riotous mix of imagery. These videos are sometimes sympathetic to, but frequently parody the instantly familiar, highly commercialised phenomena of the music video. The conventions of the music video are known to anyone who has seen MTV. A group of choreographed and identity conscious musicians feign a convincing performance, while, in fact, lip-syncing to pre-recorded material. As viewers, we are party to this illusion, believing we are witness to the live recording. If we reject this pretence, then the video is fake in content and intention. 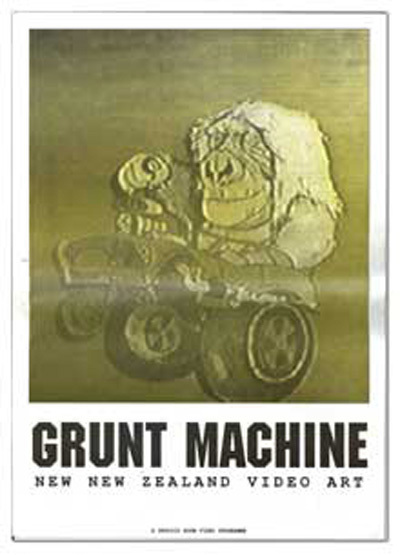 So it is that a number of the works in Grunt Machine pick up and expose the deceptions of the genre. Rachel Shearer’s Hopping Mad is an extreme take. The camera is hand-held, literally hopping, roving and jumping in quick sequence over often unidentifiable objects. Marked by a playful amateurism, the work uses the basic qualities of music video; performance, quick edits and sound track, but its no-frills results subvert the highly polished, commercial form it references. The presence of commercialism in the context of music video is also registered in a saturation of media icons, corporate logos and advertising. Grunt Machine engages with this characteristic. David Townsend’s Ecstasy parodies the cult icons, the Teletubbies, by presenting them dancing to the hyper-beats of techno music. Townsend’s aim is to link these fictional stars of children’s TV, with the drug ecstasy, an inextricable accessory of the dance music scene. The absurdity of the Teletubbies on Ecstasy is indicative of the unexpected twists and fantasies played out in the Grunt Machine. Alternatively, music and image in Megan Dunn’s The Persistence of Memory, seem mutually exclusive. Using familiar imagery from the works of Surrealist painter Salvador Dali in order to contextualise a romantic eighties love song, Dunn creates a mismatch. Questioning the often tenuous relationships established between sound and image in rock video, she undermines their roles in conveying narrative or concept, to the viewer. Curated by Gwynneth Porter and Simon Cuming for The Physics Room, Christchurch.